Hunting, trekking or working in the woods – or out in the field – are very demanding activities. 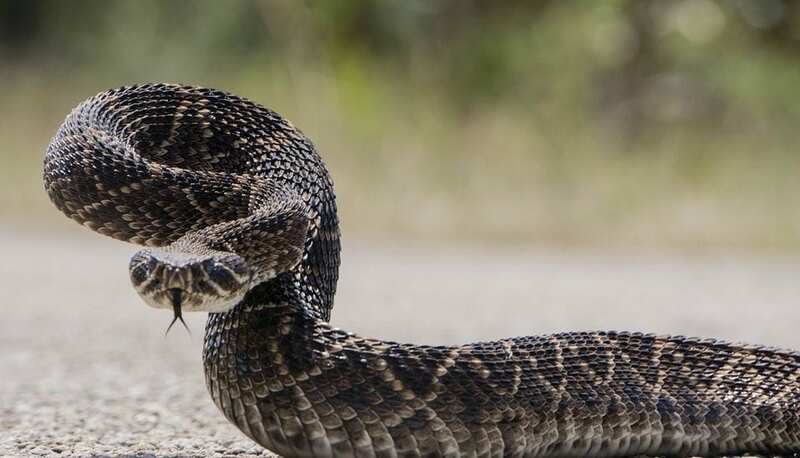 And because you can’t always keep an eye on your feet and what lies next to them, you might bump into a venomous snake and not even realize it. Now, if you are unfortunate enough not to wear one of the following top ten best snake boots that we’ve gathered into our list, you could land in some serious danger. So, safety first, pick only the best boots out there based on their quality, overall user satisfaction, material, and type of use. We have highlighted the top 5 best snake boots to help you make an informed decision about each item and its specifications. Better safe than sorry when out there! These Muck snake boots have a PK mesh lining and a reinforced midsole for extended support of your Achilles heel. You can use them in the woods, in the mud, or in water. While sturdy and resistant, they’re breathable, so your feet won’t catch fire nor will they catch that sweaty smell after too much use. These Chippewa snake boots are recommended as the best snake boots due to their ultra-water resistant material, ruggedness, and durability. While they offer protection from snakes’ fangs, it is best they are used during the cold or wet seasons, such as fall or winter. You can put them on or take them off in as little as 1-2-3. Remember to treat the leader, otherwise, they can lose their waterproof quality. The LaCrosse Adder snake boots are for those heavy-dose outdoor trekking aficionados. They have a steel shaft to protect your feet from potentially dangerous snake bites. All the while they have a removable Polyurethane footbed and the 18″ height will cover your feet from the bottom up to your knee. And the reinforced toe cap will offer supplementary abrasion resistance when in bushy areas. Next on our best snake boots list is this Rocky Lynx snake boot. Made of rock resistant and waterproof material, the manufacturer assures that you can use them in watery areas without having to worry that your feet would get wet. The camo material will help you keep stealth whenever you go hunting. Moreover, they have a quality Terra suspension footbed, thanks to that your feet get both suspension and cushioning for comfort. 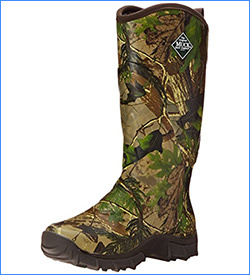 These MuckBoots have a full rubber exterior coating to protect you against rattlesnake bites. But, not to worry, they’re breathable enough to be used during warmer seasons at the same time. So you can use them without any problem in different types of terrains. And the camo material will help you become a real stealthy hunter. Using full-grain leather and 1000 Denier nylon materials, these Danner snake boots are guaranteed to be worthy of the best snake boots title. The 1000 Denier nylon ensures that what you wear is fully waterproof. 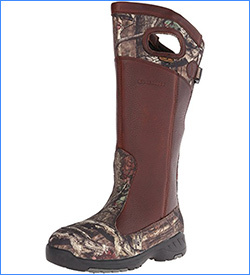 The full-grain leather makes the boots resistant, and effective against snake bites. You can use them on wet grounds, on hot or dry land, and even on uneven ground. That’s because the lacing system will make them snug. 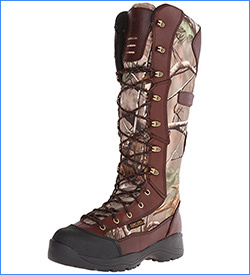 Take your trekking or hunting passion to the next level with these Cordura outdoor snake boots. They will help you have cool feet while protecting you from snake bites thanks to its tough leather material. 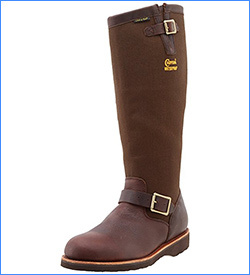 And, at the same time, the lightweight fabric will not make them feel like you’re wearing two cannonball-like boots. 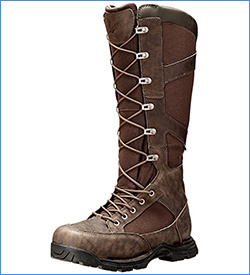 Moreover, these boots have enhanced durability and lightweight traction that are offered by the outsoles for more trekking or other activities in the wild. 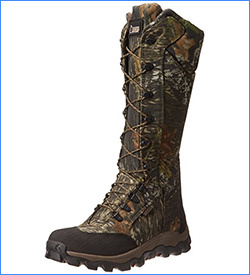 On our number 3 spot, we have some of the best snake boots that you can buy: the Irish Setter Vaprtrek. They have an RPM sole for extensive hunting sessions, this lightweight material allows you to have an active lifestyle for prolonged hunting. Has the ScentBan technology to control odor so that, even after prolonged use, you won’t have to wash the boots right away. And all the while you have an abrasion-resistant material to protect your boots and feet even on the hardest and harshest of terrains when out there scouting. 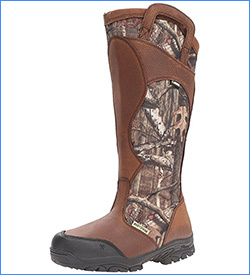 These Rocky ProLight snake boots have a shaft that goes from your arch all the way up to your knees, so you are bound to be protected all the way up. Made with full-grain leather and nylon, they’re sturdy, resistant, and durable. And not only this, but the mossy oak will help you blend in the landscape when on hunting sessions. 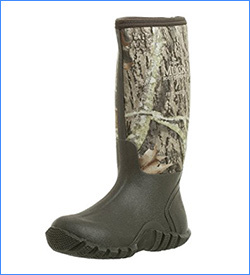 These LaCrosse snake boots are made from an ultra-quality material that is both waterproof, odor-free, and resistant. 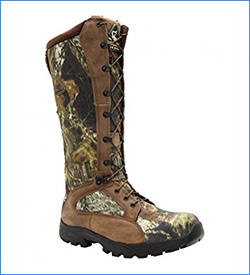 You can use them in multiple conditions: be it hunting, trekking, or for working in the woods. You can also check out the best hiking boots available today on the market. While there are no perfect boots, we are sure that our list of the best snake boots contains at least a pair that will keep you safe if you happen to startle venomous snake. 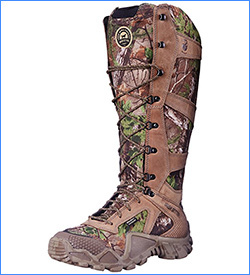 But before buying one of these boots, make sure that they fit you perfectly so that you don’t take them off when in a snake-ridden area, as most snake bites happen when people don’t wear any snake protection. If you have questions or want to make recommendations, do not hesitate to contact us, and let us know what you think. And don’t forget to follow our site for more interesting reviews outdoors!